Kazuma "The Shell Bullet, The Treasoner, Kazu-kun"
Age 16 - Known as The Shell Bullet in the anime and Kazuma "The Treasoner" in the manga. A Native Alter from the Lost Ground, he was initially classified as a Class "C" Alter User by HOLY, but was risen to Class "A" after defeating Asuka Tachibana. However, when Kazuma and Ryuho violently clash in Episode 13, Tachibana states that their power has to be of Class "S" Alter Users to cause so much devastation. He is regarded as the most dangerous Native Alter in the Lost Ground. Kazuma is mostly a reckless person with little regard for his own safety. He will do anything for the right price, although he does show concern and care for his close friends. He lives with Kanami Yuta (who is also an Alter User) in an abandoned dentist's office. 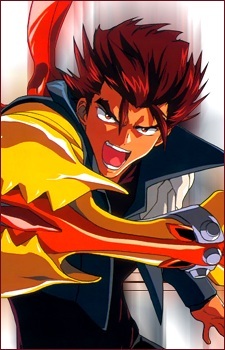 He has a strong rivalry with Ryuho, which is featured prominently in the series. He is the student of HOLY member Straight Cougar, whom Kazuma refers to as his "big brother." Kazuma's Alter power is Shell Bullet, an alloy fusion type Alter. In its first form, his right arm is covered in a protective metal alloy and three curved fins are created on his right shoulder blade. In this form, the fins disintegrate and propel him forward at great speed. When a fin is disintegrated, Kazuma shouts either "Shocking First Bullet" if it is the first fin, "Annihilating Second Bullet" if it is the second fin or "Exterminating Last Bullet" if it is the third fin. He mainly has three transformations, and with each one, he wears more and more armor. His last form in the Anime is similar to a lion, the armor covers his entire body, with a tail-like protrusion in his back that allows for high speed movement. Due in part to keeping his ability and true employment a secret from many of those in the Lost Ground he is considered a bum, coward, and lazy. (At least during the beginning part of the series). However, he returns the insults with attitude and insults of his own. Except however for those closest to him to which he truly respects and cares for, such as Kanami Yuta whom he treats as a little sister. He still keeps the secret from them, but allows them to treat him however they wish.